Full disclosure here. I have been guilty more than once of what I am about to caution you against doing. My guess is that this has happened to almost every Bible class teacher in the world at some point in time. You probably know the scenario. You are having one of those weeks. Your car and two appliances broke down, you have been fighting a bad head cold, your in-laws and their five dogs have been staying with you and you had to bake four dozen cupcakes for “tomorrow” twice this week. Now, it is Sunday morning and you haven’t had time to think about, much less read your lesson for today. Thankfully your worship service is before Bible class, so you decide to scan the lesson during the sermon and let the kids illustrate the story. When the sermon starts, you glance at your teacher’s manual. Whew! It’s Noah. You know that one, so you close the manual and listen to the third lesson in a four part series. As you begin to tell the story during class, you realize you have forgotten a couple of details after all. Was that one pair of unclean and two or seven pairs of clean animals? How big was the Ark anyway? How many days were they floating around? Wasn’t it forty something? Then it gets worse. Your students are all paying attention today and for some reason are in an inquisitive state of mind. What is gopher wood? Did God take bugs on the Ark? Why did the dove come back? Suddenly, you are feeling a little woozy and sort of remember some verse about teachers being held accountable that always sounded scary when it was read. You may even wonder by the end of class why you volunteered to teach at all. After having a couple of these experiences myself, I hit upon a solution that actually provides an additional side benefit. I purchased an NIrV Bible. Personally, I prefer a translation over a version like The Message that summarizes ideas and can be rather inaccurate at times. While not perfect, the NIrV is the best translation I have found so far that is basically accurate, yet still written on a third grade reading level. When it’s time for the lesson, I either read the scriptures directly from the Bible or summarize a few verses at a time in a story telling style. Either way, I make sure and try to explain things as I go to increase comprehension. I have found by reading or telling the Bible story straight from the Bible, I am much less likely to leave out or mess up the details of the story. Plus, if a student asks me a question, I have the Bible already opened to the passage and can quickly skim for the answer if I don’t remember it. You can also keep a second adult Bible with study notes opened to the same passage. The notes can help you, if the kids ask a cultural or historical question about what you are studying. So save yourself some stress and start reading the story straight from the Bible. Not only will it make your classes run smoother, but also your students will become comfortable with the language and style of the Bible. 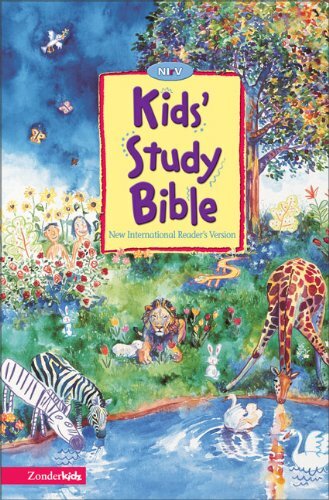 This will help them a lot as they begin transitioning to independent Bible study.